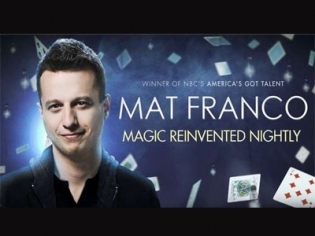 Save $35 on great seats to see Mat Franco. Prices start as low as $58 each. Save up to 57% per ticket when you make your reservation online today. Tickets start as low as $58. Save $20 off tickets to see America's Got Talent Winner, Mat Franco, in his NEW Las Vegas show that puts a fresh & fun twist on magic. Enter offer code AFF25 before selecting your seats to apply promotional rates. Tickets start at just $68 before taxes and fees. Reserve your tickets now to save up to $21. Rates start at just $59 before fees and taxes. Fresh, feel-good magic by the only magician to ever win “America’s Got Talent,” Mat Franco. America’s Got Talent Winner Mat Franco, magician extraordinaire, takes the stage at The Linq with a full-scale, never before seen magic production. This magician, who has been performing in Vegas since the tender age of 15, is now 28 and has developed this improvisational comedy magic show that will be unforgettable and unique to all audience members. Mat Franco has an upbeat, breezy style that will make you feel good and his pure joy at his craft will infect you with his love of magic. He gets up close and personal with the crowd and his magic tricks will astound and amaze you! I enjoy magic shows and Mat’s show was awesome. Not only was he funny and entertaining, he pulled off some mind blowing tricks and included some audience members into his acts.